It’s a chilly morning as we head out to the car. It was certainly a comfortable night at the Raford Inn and I’m grateful for Rita and Dane for making it special. I don’t feel very excited this morning to race. Our sweet kitty Barry disappeared on Tuesday and I’ve been missing him terribly. My body also doesn’t feel really sharp this morning. I really hope to swim 1:05 today. The last time I did that was at my first Ironman in Canada 10 years ago. Troy has challenged me to ride under 6 hours which would be about a 18.8mph average. 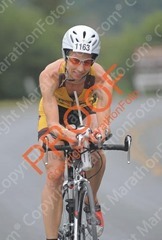 My best split for the bike is 6 hours and it was here at the AquaBike in 2006. I cannot imagine it being possible to do that today. Two weeks ago I couldn’t even average 15mph for 100 miles…but with Jesus anything is possible and if I make the goal it will be a miracle. I’m lined up with men and women in my age group, and below, in yellow caps. I know it’s going to make for a fast start and even a rough start. Ready, set, go! Sure enough a small pack gets out front and I try to hang with the next group. I’m not getting bumped around as expected and I’m thankful for that. As I head up stream it’s pretty clear sailing and I don’t have to avoid many swimmers. I catch and pass some other yellow caps. I haven’t yet found someone to draft off of. I know that drafting is important to get the goal so I am looking harder today for help. Finally towards the turnaround I find a yellow cap and latch on. This is the most shallow part of the course today and lots of folks are walking. It’s odd to be passing someone who is towering over me! I make it around the buoys and head back for loop 2. As I come close to the next turnaround to head back out, I’m looking for yellow caps on the other side. I see some way ahead but just a few. It makes me wonder where I am. My draft is slowing down and so I decide to go it on my own and look for another swimmer. I check my watch after the turn around and I’m at 35 min. I’m going to really have to make this loop count! I don’t find anyone consistent but grab onto some drafts here and there. Finally, just before the turnaround, a small pack of blue caps come up from behind…yes! I get on a guy's feet and stay there. I make the turn and find myself surrounded by blue caps. I don’t want to give up my nice draft so, like a dog guarding his food, I keep looking around to make sure no one moves in on me. Eventually our pack heads into some other packs of swimmers and I loose my guy. Thankfully there’s another blue cap to latch onto. This has turned out to be a great find and I ride the wave of blue caps all the way to the finish. I get out of the water and pull off my wetsuit. Again, it gets stuck at the bottom of my feet but I’m able to pull it off quickly. I check my watch as I run up the ramp and see 1:05! Yes! That means I might have finished at 1:04! Thank you Jesus! I get to my bike and quickly throw my swim stuff in the race bag. I opt not to put on my jacket because I feel like the air temperature is good. I also stuff it into the race bag. I grab my bike and run out of transition. There is a steep hill immediately outside of T1 to climb. Lots of folks are walking it probably because their bikes are not in the right gear. Since I set my gear to it’s easiest setting, I’m able to climb out. It’s hard though dodging those who are walking. At the top I see the girls and Troy. It’s so nice to hear their cheers! I’m off! I look down and see that my Garmin isn’t turned on. Darn! I turn it on knowing it will be a few minutes before I can start it. Once it loads up, I remember that I forgot to remove the current mph from the screen. I feel like I’m texting and driving as I change the settings on the road…not a great plan for sure! The plan is to focus on the average mph. Mentally, it’s better to see what’s going on overall so that I don’t feel pressure when I slow down on the hills. The plan is to go for 19mph on the first loop and averaging 18.8 mph overall to get a sub-6 hour time on the bike. Things are going great as I ride off from Johnson’s Beach. My average is over 19mph and I’m feeling comfortable and strong. Just before mile 6, we turn off the main road and into a neighborhood. At the turn, I pass a guy that clearly is struggling with his bike handling. I feel safer now as I ride on. We come up on a short steep hill and I follow Troy’s direction not to hammer but to go up comfortably. Out of the corner of my eye, the guy I just passed starts to pass me on the hill. Suddenly I see him coming right at me perpendicularly! I shout out “whoa” and quickly stop on the hill. The guy just barely missed sideswiping me and I thank God that I’m still upright. The guy says sorry and I get going again. As I bike away, I hear a big noise and look back to see him falling to the ground bike and all. I shout back “you can do it” and continue on. Poor guy…I hope the rest of the day goes better for him! I look down and see that my average is down to the low 18s. Oh my! I’ll just have to work to get that up! There were a few girls I passed and now I’m chasing them. At least I have something to focus on! Mile 10 – I’m not too far from the Raford Inn and I think about how Troy and the girls will be enjoying their breakfast. I know that Troy will be packing up all of our things. We decided to head home after the race today because our beloved kitty Barry is missing. We’ve been getting calls on him since we’ve been here and it would be best to be home to look for him and field those calls. I dream about Troy telling me that he’s been found as I ride today…what a boost that would be! Well at least I can see them as I pass the Raford Inn on the second loop. My average mph continues to climb but only up to 18.7. I’ll keep working on it! I’m starting to feel more and more cold. Bummer! I should have put that jacket on even if it’s a pain to carry around later. Those gals are still ahead of me but I’m getting closer. Mile 20 – Where is the sun? I am really chilled now and shivering some. I thought I would be warm working so hard out here! I just want to feel comfortable. I’m still chasing those girls and also getting passed by some fast guys. A guy goes by in cargo shorts, t-shirt, tennis shoes and toe clips. Wow, that’s pretty amazing that he can blow by me in an Iron distance race no less! I make it to the first major climb, Canyon Road. Coming from Auburn, it’s not intimidating but it still takes an effort to climb. My average creeped up to 18.9 but now it’s going down. This hill is followed by a good downhill and I’m able to gain back some by pedaling hard going down…another strategy for today. Mile 30 – I’m starting to warm up some now. I don’t feel entirely comfortable on my saddle but it’s not too bad at the moment. My average is around 18.5mph and I remind myself that I started my Garmin late and this number could be off some. I caught one of the gals but the other alludes me. A 50 year old lady goes by on a road bike…wow! After waiting for her to make the pass and hold the pass, I pick it up and pass her back. Mile 40 – Finally I’m feeling warm and the sun is shining! I’m approaching the “big” climb of the course, Chalk Hill. Again, coming from Auburn, it’s not a huge challenge but it’s still hard. I cross a bridge with spray paint and signs that say “bump”. I make it across with no problems. The climb begins and it feels good. I try to ride comfortably. I see the 100 mile mark and make a mental note. I’m sure looking forward to getting to that marker! That 50 yr old gal and I have been going back and forth…she’s leading the hill. Up and over and I pass her. Mile 50 – Heading back to Windsor HS/T2. I won’t get to stop yet…one more loop. I cross Hwy 101 and have some nice flats now…my average improves. The special needs bags are coming up at Mile 57. I roll in and see my friend and FCA teammate Suzy Mattish. I accidentally go too far and a nice volunteer runs back to get my bag. I restock my fluids and snacks. The 50’s gal goes past as well as those other gals from the beginning. I just remind myself that it’s good motivation. Mile 60 – I’ve been passed by two more girls. One of them was just flying and I know there is no way I can catch her! Here’s the Raford Inn! I see tons of folks her cheering. There’s Anna & Ariel…there’s Troy! I cannot make out the others but I know that Rita and Dane are among them. I smile and wave. My hip flexors are very sore and mentally it’s harder to focus. As I look at my average and at the running time, I am feeling doubtful that I can go under 6hours…if I make it, it will be God’s doing! Mile 70 – I pass that guy in the cargo shorts and tell him good job. One of the gals that passed me in green compression socks, is now going back and forth with me. I’m struggling to stay hopeful for getting the goal. Mile 80 - I’m falling behind that girl. My hip flexors are screaming. My average is barely 18.5. I think about stopping when I see Troy and the girls and just hanging out for a bit. I know that’s a bad idea and a bad example for the girls. I need to show a good attitude under the adversity. Again, I dream that I get the good news of Barry coming home. I climb up Canyon Road again. A girl rides by and I just feel bummed out. I see Troy ahead. The girls must be asleep in the car. I point to my hip flexors and frown. He tells me that I’m 2 minutes ahead. What?! Is that possible?! That’s good news. It gives me a boost! Mile 90 – I’ve actually have caught the 50 year old, the girls from the beginning of the race, the green socks gal, and the super fast gal that passed me. It looks like that super fast gal blew up and she’s pedaling cadence is slow. I’m in complete shock how this race has turned around! Lord, You are amazing! I notice that a helicopter is hovering really close to me. It seems to be following me…weird! It just must be a wine tour or something (Later I find out a British reality show was filming a gal racing). Mile 100 – So glad to see that marker! Yes! I am bummed though because lost my bike bag going over that bumpy bridge. I thought a water bottle fell out and then I realized down the road what it was. I debated going back because I’m so close to making the goal and because I though it could be dangerous to try to grab. If I get a flat the goal is done but I have faith that the Lord is going to protect my wheels. Up and over Chalk Mountain. I’m still in pain but I’m motivated to get to that finish line! I pass someone with a flat and am sad that I have no tools now to help. I pray that someone else can help! Mile 110 – 2 more miles! I cannot believe it! I’m going to make it under 6 hours! I’m passing some guys that were ahead for a while. Lord, how could I ever doubt you! Just then I see Anna on her scooter. I want cry! “Anna, it’s mommy!” She is excited and yells for Troy to come. It looks like they weren’t expecting me. I love how the Lord lets me surprise Troy. It’s so great to see a flash of their smiling faces! 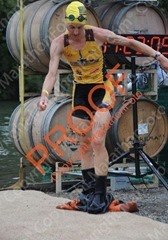 I hammer the last mile and cross the dismount line. I’m done! And it’s 5 hours and 56 minutes! No way! Jesus, You rock! Thank You so much!